There are now two leadership races taking place in the province of Alberta. While Jim Prentice's apparent intention to run for the leadership of the Progressive Conservative Party has made national headlines, Brian Mason's resignation yesterday as leader of the Alberta New Democrats was somewhat quieter. Both leadership vacancies are for parties who have seen better days, but unlike the case of the Tories, Mason is handing the party over to his successor in better shape than it was when he took over. The chart below shows the electoral results of the Alberta New Democrats going back to their first election in the province under that name. It shows that Brian Mason has been the most successful of the post-1993 leaders of the New Democrats, but was never able to get the party into the same position that Grant Notley and Ray Martin had placed it in the 1980s. Under the party's first leader, Neil Reimer, the NDP took 9.5% of the vote but was kept out of the legislature in 1963. The NDP's vote share increased to 16% in 1967, but the number of seats won by the party remained at zero. Grant Notley was not able to improve upon Reimer's 1967 performance in terms of vote share until his fourth and final election in 1982, when he captured 18.8% of the vote and won two seats. Nevertheless, his tenure saw constant improvement for the party. Notley passed away in 1984 in a plane crash (Into the Abyss, by Carol Shaben, gives a good account of the crash and the story of survival of some of its passengers, including PC MLA Larry Shaben, the author's father). The Alberta New Democrats hit their peak in 1986, when under Ray Martin the NDP captured 29.2% of the vote, won 16 seats, and formed the Official Opposition. Though his vote share dropped to 26.3% in 1989, the NDP did retain their 16 seats and their role in the legislature. But the results of the 1993 election foreshadowed the pasting that the NDP would receive in the federal election held later that year, as the NDP was shutout of the Legislative Assembly and reduced to just 11% of the vote. The Liberals formed the Official Opposition, coming to within five points of the PCs. Despite the disastrous showing of the NDP, however, that 11% has yet to be surpassed by subsequent leaders Pam Barrett, Raj Pannu, and Brian Mason. Barret and Pannu were able to win two seats for the party in 1997 and 2001, but in both cases the NDP remained at under 9% support. Brian Mason's first election in 2004 was the best performance for the party since 1993 in terms of votes and since 1989 in terms of seats. The NDP captured 10.2% of the vote and won four seats. This would be Mason's best performance as leader, however, as the party dipped to 8.5% and two seats in 2008 before improving to 9.9% and four seats in the last election in 2012. Ranking Mason in the pantheon of Alberta NDP leaders is tricky. Of the six, he ranks fourth in terms of average vote share in elections under his leadership. Martin places first with an average of 22.2%, followed by Notley at 14.7% and Reimer at 12.8%. Mason averaged 9.5%, better than either Barrett's or Pannu's one and only showings. But in terms of average seat wins, Mason actually ranks second with an average of 3.3 seats per election. That is far behind Martin's average of 10.7 seats, but puts him ahead of Pannu and Barrett at two each, Notley at 1.3, and Reimer at zero. Overall, that would seem to rank Mason as the Alberta NDP's second or third best leader of the last 50 years. Looking forward, the polls since the 2012 election (while the polls did miss the PC/Wildrose swing, they did measure NDP support accurately) have been better for the New Democrats. Since the election, the NDP has never registered less than double-digits in any poll, and have generally recorded between 12% and 15% support (on average, the NDP has been at 13.7% in polls carried out since the last election). While this is far from the Martin glory days, it puts the New Democrats back to where they were under Notley in the 1970s. The New Democrats still have their pocket of support in Edmonton, where the party tends to poll in second or third place. Since the 2012 vote, the party has averaged 21.2% support in the city. This compares quite favourably to the 9.2% support averaged in Calgary and the 12% in the rest of the province. So the next leader of the Alberta New Democrats should have reasonable hopes to put up the party's best numbers since 1989 in the next election. If the campaign goes well, and Prentice (or whoever takes over the Alberta PCs) fails to turn the governing party around, the NDP could also reasonably hope to win more seats in Edmonton and potentially elsewhere. Some scenarios when Alison Redford was polling at her lowest even suggest the NDP could form the Official Opposition to a Wildrose government. The next leader of the NDP will need to build a higher profile than Mason, however. Despite leading the party for a decade, Mason still averaged 32% "unsures" on approval rating questions, slightly higher than relative newcomer Raj Sherman of the Liberals (30%) and significantly higher than either Danielle Smith (17%) or Alison Redford (10%). And of those who did have an opinion of him, that opinion was split: 34% approval to 33% disapproval, on average, since the 2012 vote. A new leader who can build more personal popularity may, then, be able to make some significant gains. The scale and stakes of the job are certainly smaller than the one Jim Prentice is targeting. But the next leader of the NDP can come to the role with optimism. That is a far cry from the difficult task facing the next leader of the Alberta PCs, whether it be a saviour like Prentice or not. When Angus Reid Global reported last week that the Conservatives held a narrow two-point lead over the Liberals, many eyebrows were raised. And with good reason: the number of polls released in the first year of Justin Trudeau's Liberal leadership in which the Conservatives held a lead could be counted on the single hand of a clumsy butcher. But instead of the next poll to hit the wires refuting these findings, Ipsos Reid's poll for CTV/CP24/Newstalk1010 has corroborated the new state of affairs. Now that a month has passed since its initial release, the price of "Tapping into the Pulse: Political public opinion polling in Canada, 2013" has been reduced to $9.99. With elections approaching in Ontario and New Brunswick, now is the time to review what happened in 2013 and how the new leaders of the provinces' respective Liberal parties fared. The ebook can be ordered in all formats from Gumroad, or direct from Amazon for your Kindle or Kobo for your Kobo reader. Ipsos Reid was last in the field between February 14-18. Since then, the Liberals have dropped four points to fall to 33%, while the Conservatives have increased by four points to meet the Liberals in a tie. The New Democrats were unchanged at 24%. The Bloc Québécois was up one point to 6%, while the Greens were unchanged at 3% and 1% of respondents said they would vote for another party. Of the entire sample, 16% were undecided (a drop of two points). None of these shifts, including that of the Liberals and Conservatives, are outside the margin of error of a probabilistic sample of this size. However, the Tory and Liberal swing is large enough - and backed up by the swing recorded by Angus Reid - to pay attention to it. Among what Ipsos classifies as likely voters (those who say that nothing short of an emergency would prevent them from voting, a method I consider preferable to turnout models based on potentially out-of-date assumptions) the Conservatives inched upwards to 34%, while the Liberals and NDP were unchanged. Compared to the mid-February poll, that represents a three-point gain for the Tories among likely voters, and a drop of two points for the Liberals. While that is a small blip, the Conservatives have increased by six points among likely voters since Ipsos's previous poll of January 31-February 4, while the Liberals have dropped five points since then. The surge in support for the Conservatives recorded by Ipsos Reid was less dependent on an increase in one province alone, which was the case of Angus Reid. For example, the Tories were up by double digits in Alberta and Atlantic Canada, as well as more modestly in Ontario, the Prairies, and British Columbia. In B.C., the Tories led with 41% against 27% for the NDP, 25% for the Liberals, and 7% for the Greens. While the shifts since February 14-18 were insignificant, the Conservatives have now registered increases in support in three consecutive Ipsos polls stretching backing to November 25-27. In all, the Tories were up 13 points since then, while the Liberals dropped 12 points over three consecutive polls. The Conservatives were up to 63% in Alberta (a gain of 17 points over the last two polls), while the Liberals were down 23 points to 16%. This is likely more of a reset from an anomalous poll than anything serious. The NDP was at 16% support here. In the Prairies, the Conservatives led with 45% (up eight points over the last two polls), followed by the Liberals at 31% and the NDP at 20%. The Conservatives were narrowly ahead in Ontario with 36%, followed by the Liberals at 34% and the NDP at 27%. The Liberals were leading in Quebec, however, with 37%. That is up six points over the last two polls. The NDP was unchanged at 28%, while the Bloc stood at 24% and the Conservatives at just 9% support. In Atlantic Canada, the Liberals were at 54% (down eight points over the last two polls), followed by the Conservatives at 33% (up 21 points since mid-February) and the NDP at 10% (down 15 points). With these levels of support, the Conservatives would likely win around 150 seats, with 111 going to the Liberals, 58 to the New Democrats, 18 to the Bloc Québécois (thanks to vote-splits), and one to the Greens. The strong showing for the Conservatives in the West puts them back into a position to flirt with a majority government. They can win many more seats than the Liberals thanks to their advantage west of Ontario. But what would the Conservatives need to push that bar over the 169-seat mark needed to form a majority government? Let's start with this Ipsos Reid poll, and adjust the numbers by one point at a time in each of the regions. We'll take 0.6 points from the Liberals and 0.4 points from the NDP for every uptick. By using this method, once we get to 38% for the Conservatives, with the Liberals at 30% and the NDP at 22%, the Tories reached the 169-seat mark (the Liberals take 94 and the NDP 50). So, they are still quite a long ways from a majority government. The Liberals are even farther. Starting with the same assumptions but subtracting 0.6 points from the NDP and 0.4 points from the Conservatives for every point gained by the Liberals, the party surpasses the 169-seat mark at 42%, with the Tories at 29% (and 118 seats) and the NDP at 19% (and 26 seats). This starts with the Conservatives at a relatively high level and the NDP at a relatively low one, so it may be overly penalizing on the NDP, but nevertheless the relative efficiency of the Liberal and Conservative vote is clear. These two polls by Angus Reid Global and Ipsos Reid might mark a significant turn in the Canadian political landscape. Have the Conservatives really recovered from their historic lows? Is Trudeau's appeal starting to waver? Is this a momentary blip or something real? While we now have a much better idea of what is going on than we did when Angus Reid first reported, we are still in wait-and-see mode to see whether this shift is going to stick. The Ontario Liberals and Tories are neck-and-neck. Or the Liberals have a wide lead. Or the Tories do. Should we split the difference? The current aggregate of the polls puts the PCs and Liberals in a tie with 34% apiece, with the New Democrats trailing at 25%. That is probably as clear as it gets in Ontario, as no two recent polls agree on what the situation is in the province. The chart below shows the province wide results of three polls conducted in Ontario in the last few weeks. All were done within a window stretching from April 7 to April 14, surveying roughly similar numbers of Ontarians but using three different methodologies. The Forum poll, the earliest of the three, gave the PCs a seven-point lead over the Liberals, with 38% to 31% support. The Nanos poll, the second of the three but the one released most recently, put the Liberals and Tories in a tie with 36% apiece. The Innovative poll, the most recent of the three, gave the Liberals a nine-point lead, with 39% to 30% for the Tories. One might be persuaded to see some progression across these three polls, with the Liberals gaining eight points between April 7 and April 14, all at the expense of the Tories, but that would not be the appropriate conclusion. For one, that is too short of a time span for such a dramatic swing in support. Secondly, different polls conducted by different firms using different methodologies should not be used in that manner. Nevertheless, the three surveys should be in the ballpark. They aren't even in the ballpark in terms of trends. Nanos has shown a swing from the NDP to the PCs compared with their last survey of Feb. 28-Mar. 3. Innovative has recorded a swing away from the PCs and NDP towards the Liberals since their last poll from March. And Forum has registered a swing from the Liberals to the PCs compared to their poll of March 24. The one thing the three polls seem to agree on, however, is where the New Democrats stand. All three polls put the NDP at either 22% or 23%, which represents a low-point for the party in the last few months. 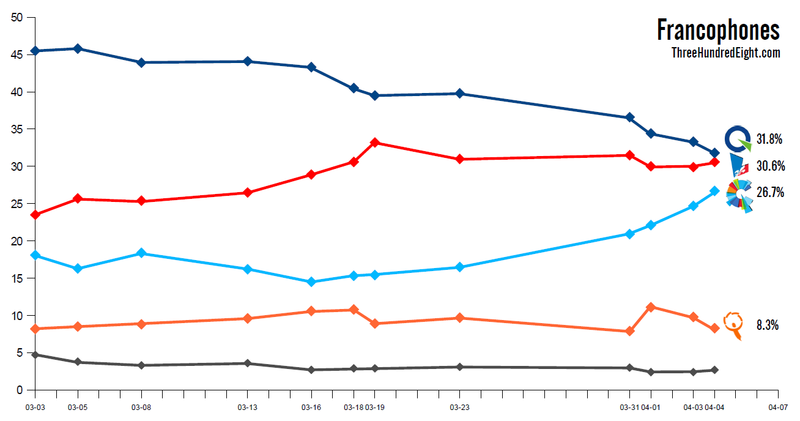 All three polls also show either stable or negative trends for the NDP, suggesting that Andrea Horwath is not heading into a potential election with any sort of momentum. But even that is not too clear. 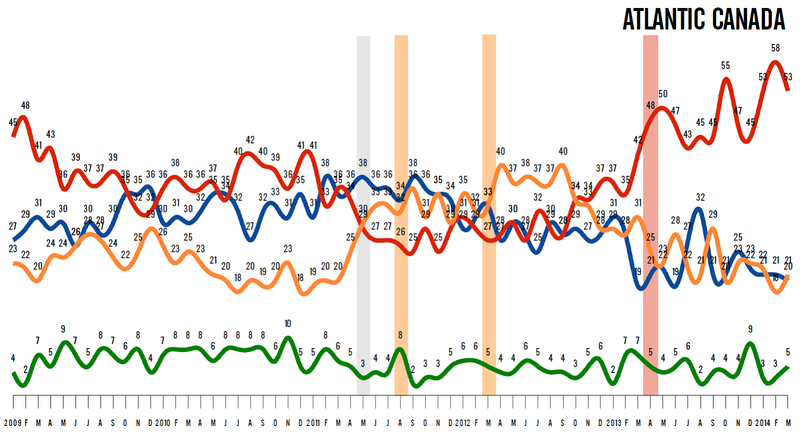 The last poll by EKOS Research, out of the field on April 3, just a few days before Nanos and Forum, had the New Democrats at 29% and on the upswing, with the Liberals at 32% and the PCs at just 27%. So if we stretch this string of polls back to EKOS, we then have the Liberals somewhere between 31% and 39%, the PCs between 27% and 38%, and the NDP between 22% and 29%. Got it? The seat implications for these sort of ranges are enormous. The three most recent polls point to anything from a PC minority government to a Liberal majority. The seat projection using the Forum poll is the best for the Tories, with 51 seats to 35 for the Liberals and 21 for the NDP. Nanos's results would end up with a similar distribution of seats as currently exists in the Legislative Assembly, with 49 Liberals, 40 PCs, and 18 New Democrats. And the Innovative poll would give the Liberals a majority government of some 59 seats, with the Tories reduced to 27 seats and the NDP winning 21. The EKOS poll would further confuse things, with 44 seats going to the Liberals and 31 to both the PCs and New Democrats. Each leader can choose a poll to back-up an election call. Kathleen Wynne would certainly like to see the results from Innovaitve, Tim Hudak would take Forum's poll, while Andrea Horwath would gladly accept EKOS's results. On the other hand, Wynne could be booted from the premier's office according to Forum, Hudak could lose seats according to Innovative (and potentially the Official Opposition role according to EKOS), while Horwath could find herself stripped of influence with a Liberal majority. Who feels lucky? At the personal level, Wynne and Horwath have better numbers. Innovative did not release any approval or leadership question results, but both Nanos and Forum did. They found somewhat similar results. On who would make the best premier, Wynne stood between 26% (Forum) and 32% (Nanos), while Hudak was second with between 24% (Forum) and 25% (Nanos). That squeezes Horwath out, who managed between 15% (Forum) and 18% (Nanos) support. On the other hand, Horwath had the highest approval ratings in the Forum poll, at 40% to 34% for Wynne and just 27% for Hudak. A majority of respondents to the Nanos poll felt that both Wynne (54%) and Horwath (53%) had the qualities of a good leader, while just 39% said the same for Hudak. That makes it difficult for Hudak to bank on a good campaign to propel him to office - his personal numbers are still very low. Horwath, however, may have the most to gain as she is seen the most positively of the three leaders. On the other hand, if the electoral choice becomes one of either Hudak or Wynne, Horwath could see herself shoved aside. Whether to pull the plug on this government will be a difficult call to make for the NDP leader. Predicting the results of this vote may be even harder. For only the third time in the last year and out of the last 49 polls, the Conservatives have placed first in a national survey. Seasoned poll-watchers know that when something so out of the ordinary has happened, it is usually an anomaly that is quickly corrected. But until a new poll emerges to confirm or refute the findings of Angus Reid Global, we can only speculate as to whether this is a blip or a sign of things to come. Angus Reid was last in the field in early March. Since then, the Conservatives picked up four points to lead with 32% support, putting them two points up on the Liberals, who fell three points to 30%. The New Democrats were down one point to 26%, while the Greens and Bloc Québécois were unchanged at 6% and 5%, respectively. As I wrote in my piece for The Globe and Mail yesterday, these are unusual numbers. They are not completely implausible, though, as a swing of three or four points between the Liberals and Conservatives is not enormous. Nevertheless, these sort of numbers have been extremely rare over the last 12 months, as the chart below shows. Each dot represents a poll that has been released since Justin Trudeau became Liberal leader. The poll highlighted in green is this Angus Reid survey. As you can see, the Conservative result is higher than any recent survey. The Liberal result is lower than any recent survey. Is it a wobble or have the Liberals really taken a hit to the advantage of the Tories? We will have to wait and see. Angus Reid also reported support among likely voters, which they determine based on a respondent's historical likelihood of voting and past voting behaviour. This is a good model for estimating likely turnout if turnout does not change to a great degree. If the assumptions the model is based on end up being off (if, say, young people turn out in larger numbers in 2015) the estimate will be wrong. This happened in the last US presidential election for a few pollsters. They assumed that the voting patterns of 2008 were anomalous and that turnout would revert to pre-2008 patterns. That did not happen, and so some pollsters, for instance, told Mitt Romney that he was going to win. Nevertheless, according to Angus Reid's estimation of likely voters, the Conservatives have the support of 34%, a gain of three points since March. The Liberals dropped three points to 29%, while the New Democrats were up one point to 27%. At the regional level, the major changes were that the Tories placed first in the Prairies (42% to 34% for the Liberals) and extended their lead to 17 points in Ontario (43% to 26% for both the Liberals and NDP). The NDP's advantage in Quebec also increased (36% to 30% over the Liberals). That the Conservative lead grew among likely voters is in line with what Angus Reid has found to be the case in the past. In February, a five-point national lead for the Liberals among all voters turned into a one-point deficit among likely voters. In March, that lead of five points decreased to just one. Among eligible voters in this new poll, the Conservatives led in Alberta and Ontario. They had 57% support in Alberta, against 20% for the NDP and 17% for the Liberals. The Conservatives led with 41% support in Ontario (a gain of nine points) while the Liberals dropped eight points to 28%. The NDP was at 23%. The surge in Conservative support in Ontario explains most of the gain the party made nationwide. It is what put them in front. But here again the numbers are unusual, as the Conservatives haven't been pegged at over 40% or with a lead of 13 points or more in the province in over a year. The Liberals led in the Prairies and Atlantic Canada, with 36% support in Saskatchewan and Manitoba against 33% for the Conservatives and 18% for the NDP. In Atlantic Canada, the Liberals had 57% support to 21% for the Tories and 17% for the NDP. The New Democrats led in British Columbia with 34%, a gain of seven points, followed by the Liberals at 31% and the Conservatives at 26%. In Quebec, the NDP was at 33% to 29% for the Liberals, 19% for the Bloc, and 14% for the Tories. With these regional levels of support among all eligible voters, the Conservatives would likely win 139 seats, with 100 going to the Liberals, 96 to the New Democrats, two to the Bloc, and one to the Greens. The Conservatives are far from majority territory due to their poor showings in British Columbia, the Prairies, and Atlantic Canada. The Liberals are hamstrung due to their distribution of the vote in Quebec, while 71% of the NDP caucus comes from either B.C. or Quebec. Among likely voters, the Conservatives get much closer to a majority with 157 seats, with 98 being won by the NDP, 82 by the Liberals, and one by the Greens. Angus Reid included some leadership questions in its poll. Stephen Harper topped the list for best Prime Minister with 27%, up four points from March, while Trudeau fell four points to 20%. Thomas Mulcair was at 16%, Elizabeth May at 4%, and André Bellavance at 1%. Mulcair had the best approval rating of the leaders, at 46% against 35% disapproval. Trudeau had 45% approval to 44% disapproval, while Harper split 38% to 55%. Comparing these numbers to Angus Reid's March poll is problematic. That poll showed increases of about 10 to 30 points in the number of 'unsures' compared to the previous poll in February, while this current poll shows a reset, with the number of 'unsures' dropping by 16 or 17 points for Mulcair and Trudeau and by 21 to 26 points for May and Bellavance. I'm not sure why that happened, but it makes it wiser to compare the approval rating results in this April poll to the last set of numbers in February. When we do that, we certainly see that Trudeau has taken a step backwards. His approval rating fell by six points, while his disapproval rating increased by six. Harper and Mulcair experienced only insignificant shifts. When asked if their opinion of the leaders had changed in the last three months, 30% said that their opinion of Trudeau had worsened, against 21% who said it improved (those numbers were 41% to 8% for Harper and 11% to 17% for Mulcair, respectively). So, the drop in support for the Liberals nationally is corroborated by the drop in support for Trudeau - though, of course, if the sample was unusually anti-Liberal the results would be repeated throughout. One interesting aspect was how support for who would make the best PM did not always follow voting intentions. In British Columbia, for example, the NDP outpaced the Liberals by 34% to 31%. But Trudeau outpaced Mulcair by 24% to 20% on this question. On the other hand, in Quebec the margin between the NDP and Liberals was relatively narrow (33% to 29%), but Mulcair was the choice of 30% of respondents as best PM, compared to just 16% for Trudeau. Support for a leader and support for a party, then, is not always contiguous. But this is one poll and an unusual one at that. We have to wait and see what other surveys show before we take these results at face value. Has the political landscape in Canada really flipped, or was this a blip? The death of Jim Flaherty, and the resulting outpouring of sympathy and analyses of his legacy, could not have had no influence on the results of this poll (the biggest Conservative jump was in Ontario, after all). We should have a better idea of the significance of this poll in a few weeks' time. The Liberals continued to hold a lead in March as their numbers stabilized after months of oscillation back and forth. Only three polls were in the field nationally last month, and one in Quebec, but nevertheless over 10,000 Canadians were surveyed on their voting intentions. The Liberals averaged 34.8% support in March, down 0.2 points since February. This marks three consecutive months in which the party has been in a narrow one-point band, the first time that has happened under Justin Trudeau. In fact, the Liberals had not even managed to hold their numbers steady for two months before 2014. The Conservatives were down 0.4 points to 28.3%, making that six consecutive months in which the Tories have been registered at under 30% support. The New Democrats were up 0.6 points to 24.8%, their best result since September 2013, continuing a positive three-month trend for the party. The Bloc Québécois was down 0.2 points to 5.7% while the Greens were up 0.6 points to 5.2%. Support for other parties averaged 1.3% in March. In British Columbia, the Liberals picked up 6.6 points to reach 36.8% in March, their best result on record going back to January 2009. The Conservatives were down 1.3 points to 28.8%, while the NDP dropped 6.3 points to 22.9%, its worst result since March 2011. Considering these extremes, the month was more likely an anomaly than anything significant. The Greens were up 0.8 points to 10%. The Conservatives led in Alberta with 55.6%, up 8.8 points since February. The Liberals were down 7.6 points to 20.8%, while the NDP was down 0.9 points to 15.1%. The Greens were up 0.1 point to 5.8%. 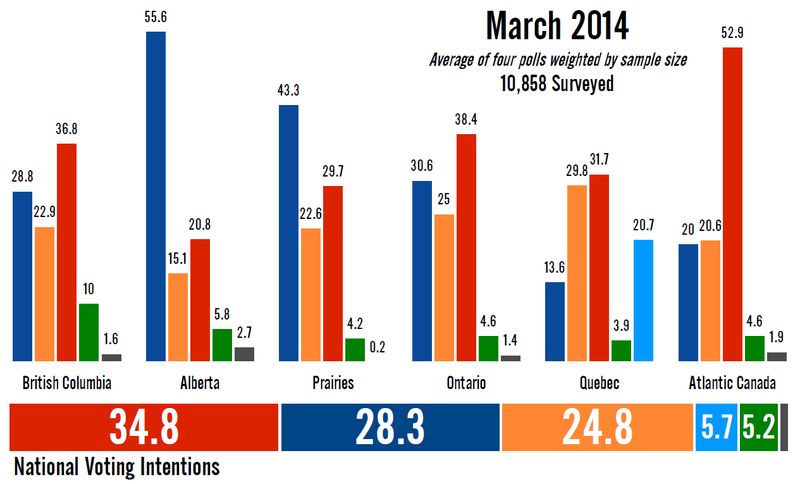 In the Prairies, the Conservatives managed their best result since June 2013 with a 3.4-point gain to 43.3%. The Tories have picked up support in Saskatchewan and Manitoba for three consecutive months. The Liberals were down 3.4 points to 29.7%, and the NDP was up 1.2 points to 22.6%. The Greens were unchanged at 4.2%. The Liberals have been very stable in Ontario, averaging 37% or 38% support over the last six months. They were up one point to 38.4% in March, while the Conservatives dropped 3.1 points to 30.6%. The NDP was up 1.6 points to 25%, its best result since March 2013. The Greens were up 0.3 points to 4.6%. Quebec - in the midst of a provincial election campaign in March - had the Liberals down 1.1 points to 31.7%. The New Democrats put up their best numbers since before Trudeau became Liberal leader, with a gain of 1.2 points to 29.8%. They have been experiencing a positive trend for four months (the NDP was at just 25% in November). The Bloc Québécois was down 1.7 points to 20.7%, while the Conservatives were at their highest since March 2013 with a 0.9-point gain to 13.6%. The Greens were also up 0.9 points, to 3.9%. The Liberals were ahead in Atlantic Canada with 52.9%, a drop of 4.6 points. The New Democrats were up 2.4 points to 20.6%, while the Conservatives were down 0.5 points to 20%. They have been on a negative trend for four months now, dropping from 25% in November. The Greens were up 1.4 points to 4.6%. The chart above shows the effect that Trudeau has had on politics in Atlantic Canada. Since he became leader in April 2013, the Liberals have managed 50% or better in five of 12 months, and have never been lower than 43% or held a lead of less than 13 points. Both the Conservatives, who last held a consistent lead in 2011, and the New Democrats, who were ahead after Thomas Mulcair became leader, have taken a hit. With these levels of support, the Liberals would likely win around 137 seats, up four since February's projection. The Conservatives dropped one seat to 120, while the New Democrats were up three to 76. The Bloc Québécois would likely win three seats, a decrease of six from February, while the Greens would win two. The Liberals make their biggest gain in Ontario, up eight seats to 61 thanks to the margin between their party and the Conservatives increasing by almost five points. The Liberals would also pick up two seats in British Columbia compared to February, but were down one each in Quebec and the Prairies and four in Alberta. The Conservatives gained eight seats in all in the West (one in the Prairies, three in B.C., four in Alberta) but were down nine in Ontario. The New Democrats were up seven seats in Quebec to 43, and one seat in Ontario, but dropped five in British Columbia. Mostly stable numbers across the board. That is not a bad thing for the Liberals, as the longer they remain in the lead the harder it will be to budge them from it. The New Democrats are showing a little life in Quebec, which is good news for them, and remain in the game. The Conservatives still appear unable to turn things around. With 18 months to go before the next election, that is not an enviable position to be in. We have not heard much out of the federal polling world since the Quebec election took centre stage, and federal politics are likely to fade to the background again if Ontario heads into an election campaign next month. In the meantime, however, the latest poll from EKOS Research for iPolitics suggests the Conservatives have yet to rebound. EKOS was last in the field January 22-27. Compared to that poll, the Liberals were up 2.6 points to 35.8% while the Conservatives were down three points to 26.7%. The New Democrats were down 2.5 points, while the Greens were up 1.9 points to 8.1%. Only the drop in support for the Conservatives appears to be statistically significant. The Bloc Québécois was up 0.3 points to 4.8%, and support for other parties was up 0.6 points to 2.7%. The number of undecideds were 10.2% of the entire sample, up 0.7 points. This is generally the status quo, then, for federal politics since last fall. The number for the Conservatives is quite low, though EKOS generally has support for the larger parties lower than other firms due to higher Green and Others numbers. In British Columbia, the Liberals were ahead with 32.2%, followed by the Conservatives at 25.8% (up 8.9 points) and the NDP at 25.7%. The Greens were at 13.8% in the province, their best result in the country. The Conservatives were in front in Alberta with 53.7%, with the Liberals at 25.9% and the NDP at 9.6%. In Saskatchewan, the Conservatives led with 46.3%, while the Liberals and NDP followed with 22.9% and 22%, respectively. The Conservatives picked up 15.9 points to lead in Manitoba with 40.9%, while the Liberals dropped 19.6 points to 28.1%. The NDP was third with 21.1% support. The Liberals led in Ontario with 40.4%, while the Conservatives fell by nine points to just 26%. The NDP had 21.1% support. In Quebec, the Liberals were ahead with 33.8%, followed by the NDP at 25.2% (down 6.5 points), the Bloc Québécois at 18.6%, and the Conservatives at 15.4%. And in Atlantic Canada, the Liberals led with 48.8% to 23.5% for the NDP and 21.4% for the Conservatives. All in all, nothing too unusual in these regional numbers. However, the large Liberal lead in Ontario is somewhat out of the ordinary. With these levels of support, the Liberals would likely win about 155 seats, putting them 14 short of a majority. The Conservatives would win 111, while the NDP would take 63 seats, the Bloc would hold seven, and the Greens would win two. The Liberals do exceptionally well in Ontario, taking 73 seats with just 31 going to the Conservatives. They also win a majority of seats in Atlantic Canada with 23. The party takes the plurality of seats in Quebec with 34 and British Columbia with 14. The Conservatives still do best west of Ontario, with 13 seats in B.C., 20 in the Prairies, and 30 in Alberta. The New Democrats take 26 seats in Quebec, with another 17 coming from Ontario and 13 in British Columbia. EKOS also probed the approval ratings of the three main leaders, finding Justin Trudeau and Thomas Mulcair to have the highest approval scores at 41.3% and 39.5%, respectively. Trudeau had a higher disapproval rating at 34.2% to 23.7% for Mulcair, but Mulcair had 36.7% either not having an opinion or not responding. That compared to just 24.5% for Trudeau and 19.5% for Stephen Harper. The Prime Minister had a very low approval rating of just 26.5%, compared to 54% disapproval. He had the highest approval rating among his own party's supporters, however, at 77.5%, compared to 77.1% for Trudeau among Liberals and 67.6% for Mulcair among New Democrats. The numbers have yet to come unstuck, as Trudeau celebrates his first full year as leader of the Liberal Party. Over that time, he has not relinquished the national lead in the polls. But can he hold it for another 18 months? Last night's provincial election results in Quebec were most certainly positive for pollsters. They called the race correctly, judging the Liberals to be in a majority position, the Parti Québécois to be dropping significantly, and the Coalition Avenir Québec to be making gains. The final polls were off by no more than a handful of points in any direction, while the aggregate performance was within two points for each of the major parties. Because the polls did well, the vote projection model did well. In fact, ThreeHundredEight.com's vote projection had a smaller cumulative error than any one pollster. The total error of the vote projection was 3.5 points across the four major parties. Next lowest was Forum Research, which had a total error of 5.6 points. The performance of the polls by Angus Reid and EKOS Research were also quite strong, with a cumulative error of 6.5 and 6.6 points, respectively. Léger's final poll had a total error of 8.6 points, while Ipsos Reid's poll (out of the field six days before the vote) had a total error of 13.6 points among likely voters. The projected vote results for the Liberals, CAQ, Québec Solidaire, Option Nationale, Greens, and other parties/independents all fell within the likely ranges. Only the PQ's result of 25.4% fell outside even the 95% confidence interval, indicating just how poorly the party did. 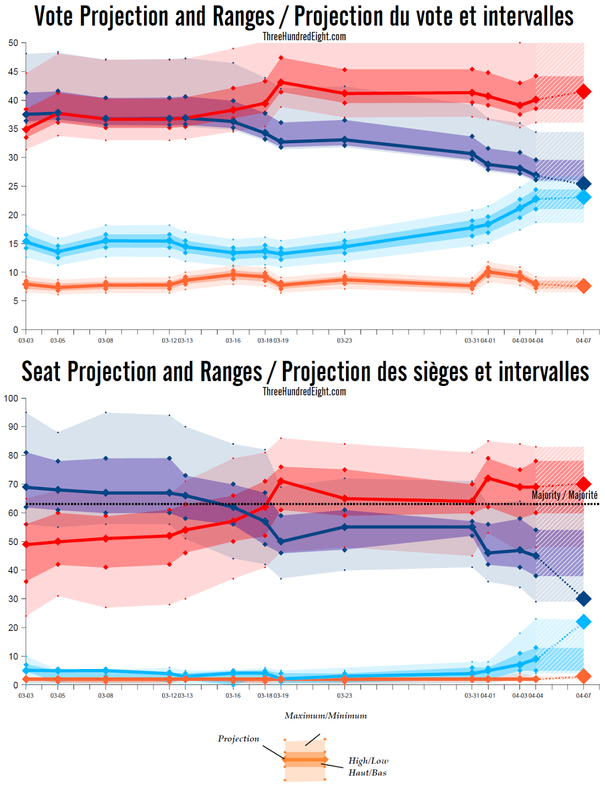 The seat projection model performed well for the Liberals, giving them 69 seats (or between 60 and 78) when the party actually won 70. For the PQ, CAQ, and QS, however, the 95% confidence interval ranges were required to capture the eventual results. The PQ was projected to take as few as 29 seats, and they won 30. The CAQ was projected to win as many as 23 seats, and they won 22. These errors occurred because of the CAQ's performance around Montreal at the expense of the PQ. Of the 10 riding-level errors where the ranges did not identify the correct winner, nine of them were seats expected to go to the PQ that actually went to the CAQ. And seven of them were in the greater Montreal area. This wasn't the fault of the polls, exactly. The regional numbers, as an aggregate, were actually quite good. Rather, it was that the CAQ won these Montreal-area seats by the skin of their teeth. A projection model can falter if a party manages to win a lot of close races. Overall, the right call was made in 82.4% of ridings, or 103 of 125. In those 22 errors, the confidence in the call averaged just 57.6% - so most of them were genuine toss-ups. Nine of them, actually, were called with 50% or 52% confidence, and more than half of them with 59% confidence or less. The worst call was in Masson, which was projected to go PQ with a 73% chance. That was the only case of the confidence being over 69% and being wrong. 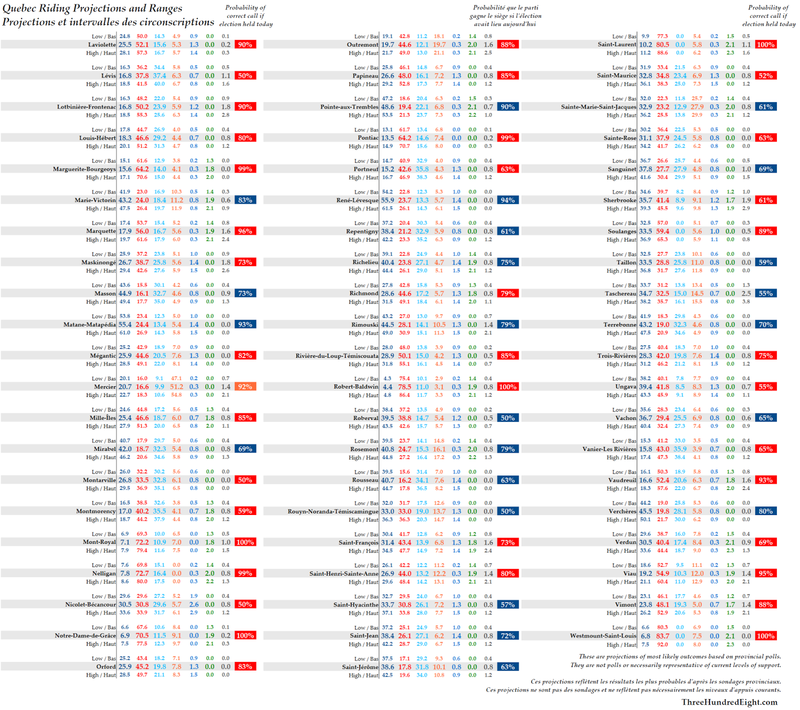 The likely winners through the projection ranges were identified in 92% of ridings, or 115 of 125. Considering the scope for error at the local level, I think that is a very positive result. The chart above compiles the regional results of last night's election, compared to the projection. As you can see, the aggregate of the polls was quite close across the board. The Liberals only greatly out-performed the polls on the island of Montreal, where it won them just one more seat than expected. They took 58.5% of the vote here, compared to the 52.1% that the polls suggested. The PQ took 17% instead of 19.7%, while QS took 12% (tying their 2012 performance) instead of 12.8%. The vote projection in the suburbs around Montreal was very, very close. The Liberals took 35.5% of the vote here, compared to the projected 34.3%. The PQ took 28.8%, compared to the expected 30.5%. And the CAQ took 26.5%, rather than 26.3%. 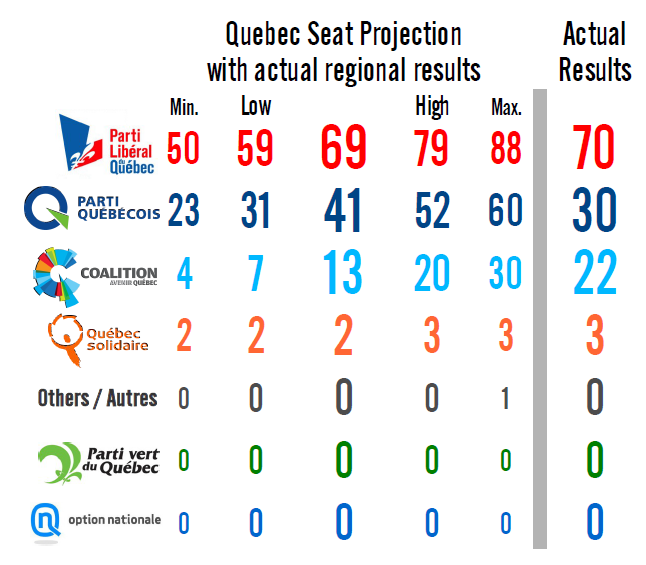 Quebec City was also quite close, with all parties projected to within 1.1 points. The Liberals won the region with 37.9% of the vote to 35.3% for the CAQ. And in the rest of the province, the Liberals, PQ, and QS were projected to within 1.2 points, and the CAQ to within 2.1 points. The Liberals won here as well, with 36.9% to 29.7% for the PQ. More specifically in the 'regions', the PQ won in eastern Quebec with 39.1% of the vote to 37.3% for the Liberals and just 14.5% for the CAQ. In central Quebec, the Liberals had 38.2% support to 30.4% for the CAQ and 23.6% for the PQ. And in western Quebec, the Liberals had 35.4% support to 30.5% for the PQ and 25.5% for the CAQ. 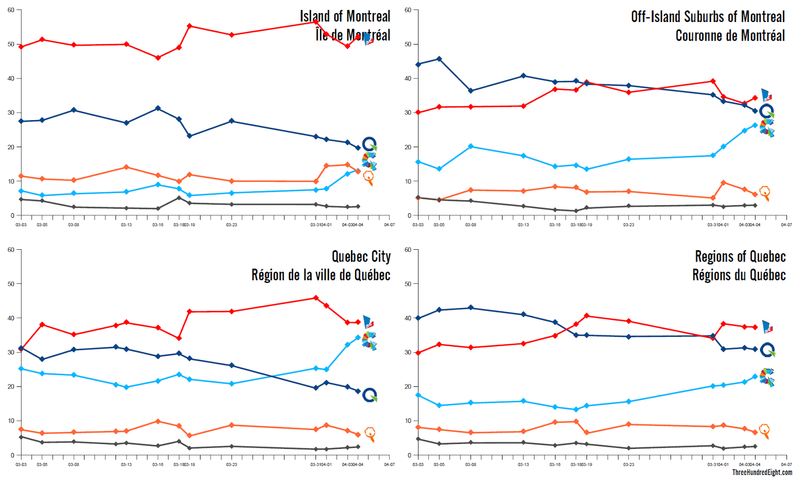 The regional breakdowns show that only the PQ was over-estimated across the board: by 2.7 points on the island of Montreal, by 1.7 points in the suburbs, by 1.1 points in Quebec City, and by 1.2 points in the regions. This explains their over-estimation in the seat projection. The Liberals, meanwhile, were over-estimated in Quebec City and the regions but under-estimated around Montreal. 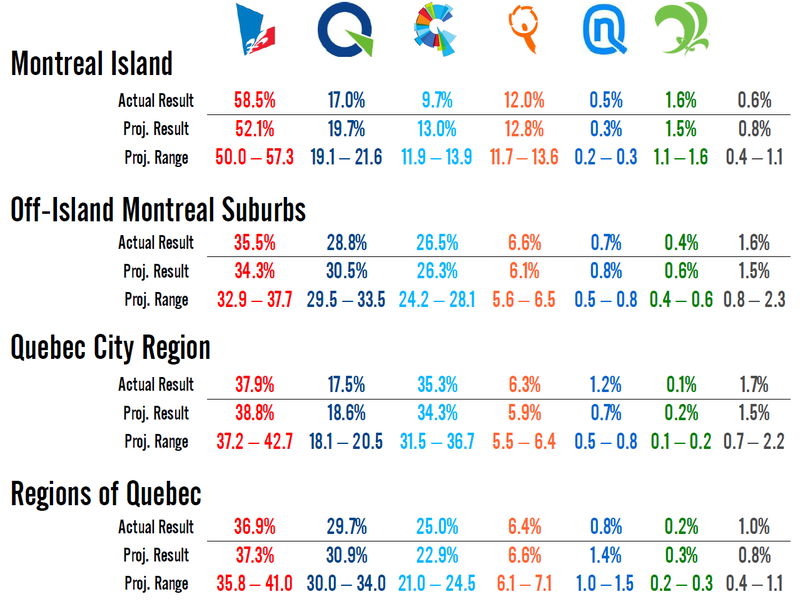 The CAQ was over-estimated in Montreal, but under-estimated in Quebec City and the regions. Even so, we're only talking about a handful of points - a spectacular performance for the polls. As an aggregate, of course. Individually, there were mixed performances. Forum did very well in the Quebec City and Rest of Quebec regions, averaging 1.4 points of error per party or less. It averaged 2.9 points per party of error in the Montreal area, but that is still quite good considering the margin of error for smaller sample sizes. Léger was within 1.6 points per party in Quebec City and the regions as well, but was 3.8 points off per party around Montreal. There was no breakdown of likely voters by region in the Ipsos poll, so it is hard to gauge. But the poll of eligibile voters did well in the regions of Quebec (2.9 points per party), but less well in the rest of the province (between 5.4 and 6.8 points per party). EKOS and Angus Reid both repeated the errors in the Montreal region that other pollsters did. GOTV operations may have been a factor here. With all the tight races, how would the model have done if the polls for the four regions defined by the model had been even more accurate? Quite well: 89.6% of ridings (112 of 125) would have been called accurately and in 95.2% of ridings (119 of 125) the winner would have been correctly identified in the likely ranges. The Liberals would have still been called to within one seat, and the third seat for QS would have been within the likely ranges. But again the PQ and CAQ results would have fallen just outside the likely ranges by one seat for the PQ and two seats for the CAQ. This should not be shocking - there was a 20.5% chance (or about one in five) of the CAQ having its result fall above the high projection band. 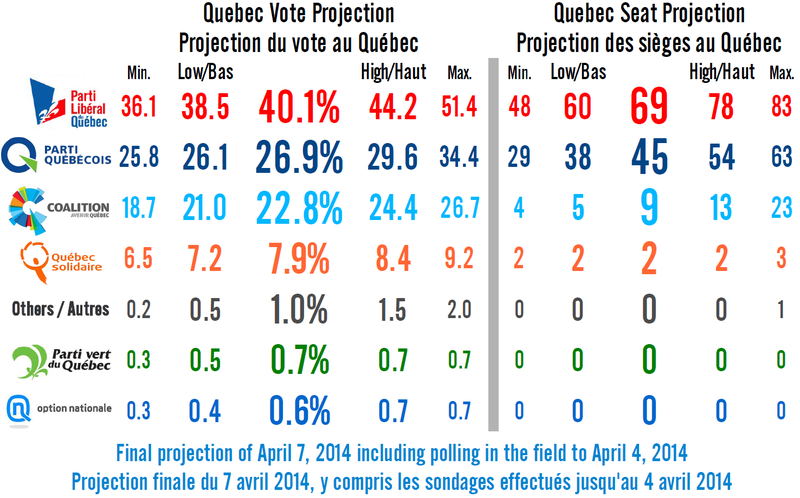 But there was only a 7.5% chance that the PQ's result would fall below the low projection. That an incumbent government under-performed to such a great extent says more about how motivated the PQ's supporters were than it does about the projection model. It also shows how well the CAQ did - under normal circumstances, they should not have been able to win all those close races. The chart to the left shows the projected results at the riding level with the actual regional results plugged into the model. You'll see that in many cases the numbers are quite close. The six ridings in which the winner would not have been identified by the likely ranges were Borduas, Chambly, Iberville, Masson, Mirabel, and Saint-Hyacinthe. It is no coincidence that these were all CAQ victories in which the PQ was favoured. It is also no coincidence that they were all actual pick-ups by the CAQ in the same region of the province. There was a serious and disproportionate CAQ gain in these regions that went over-and-above what should normally be expected to happen. This marks the second consecutive election in which the polls do a good job of tracking a race, making all the hard work put into this site worthwhile. 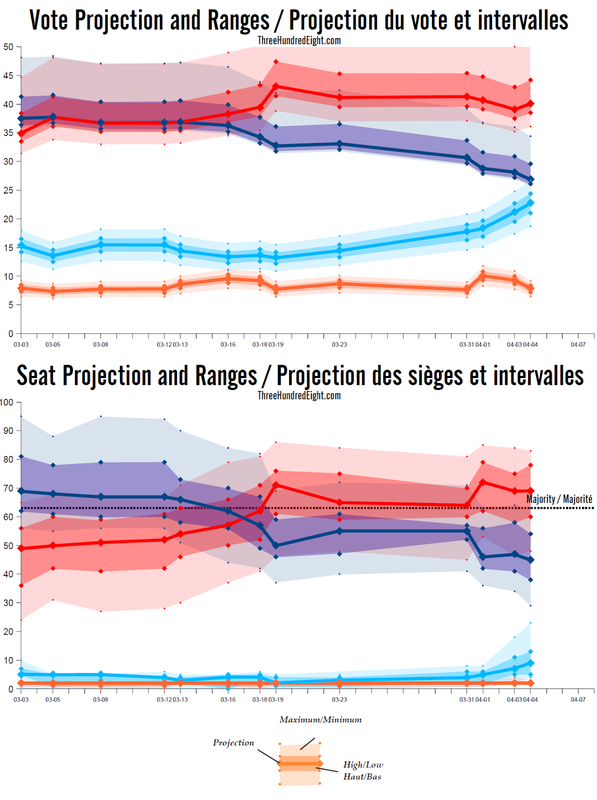 The seat projection model performed decently with the polls, and very well with the actual results. In my view, the difference between the results and the model tells us something about what happened last night, rather than about the errors of the model itself. If humans behaved in a way that was uniform and easy to predict, models like mine would be right in 99% of cases. It is where it is wrong that we see real politics at play. 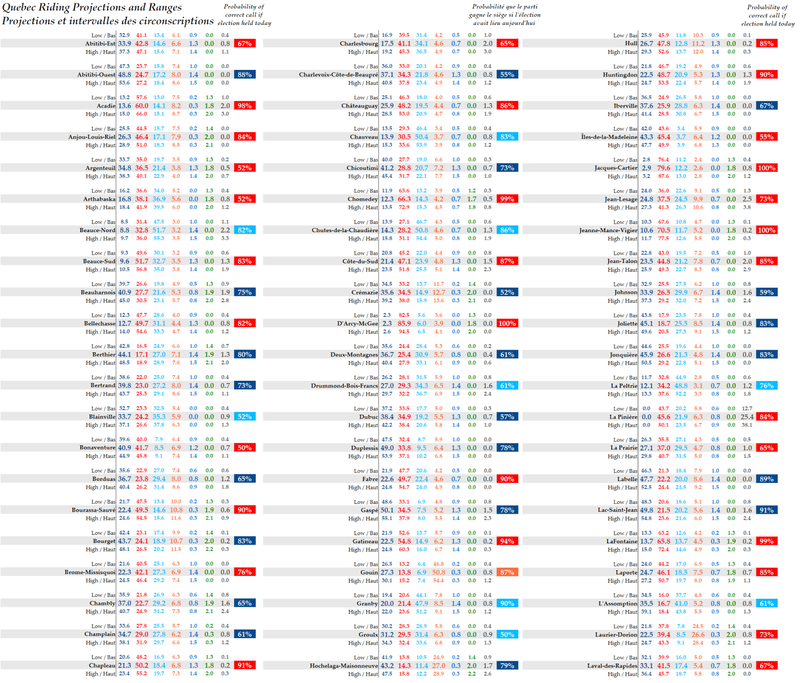 The following are ThreeHundredEight.com's final forecasts for the upcoming provincial election in Quebec, scheduled for April 7, 2014. These numbers were last updated on April 7, 2014, and reflect the best estimates as of April 4, 2014, the last day of polls included in the model. You can click on all of the charts below to magnify them. Click here to read the detailed analyses from the main site concerning the Quebec election and new polls. Based on these probabilities, there is a 65% chance that the outcome of the election for the Parti Québécois will fall between the best estimate (or average) projection and the high projection. There is an 75% chance that it will fall between the average and maximum projection, and so on. There is a 5% chance that the outcome will fall outside of the minimum and maximum ranges. The follow chart breaks the projection down by region. A description of what each region includes can be found at the bottom of this page. The following chart lists the polls currently included in the projection model that make up at least 99% of the weighted average, as well as the weight each poll carries. It also lists the media outlet that either commissioned or first reported the poll. 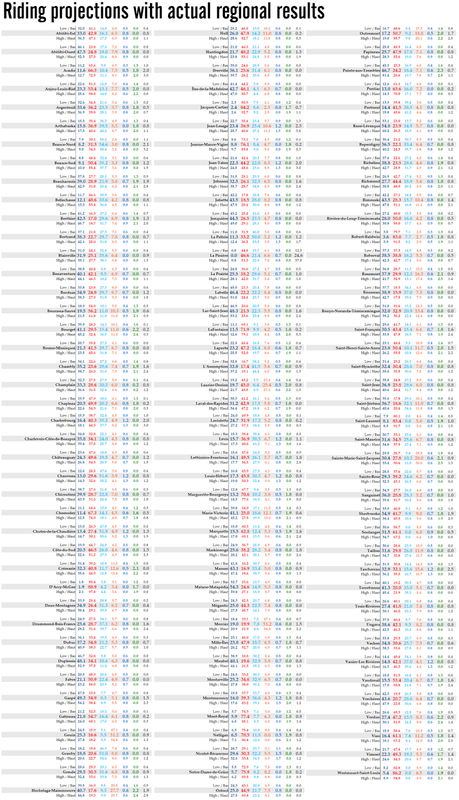 The following is a list of the current projections for all 125 of Quebec's ridings. These are the best estimates of likely outcomes if an election were held on the last day of polling. The high and low results are the estimates of likely floors and ceilings, based on the high and low vote projection ranges. The probabilities listed beside each riding is the likelihood that, if an election were held on the last day of polling, the winning party identified by the model would actually win. It does not assign any probability to a particular trailing party winning the riding - if a projection gives the leading party a 75% chance of winning, there is a 25% chance that any of the other parties could win (though, in practice, most ridings are only contests between two parties). The chart below shows the evolution of the seat and vote projections and ranges since the start of the campaign. The following charts show the current and past estimations of support among French-speaking and non-French-speaking Quebecers. The dates refer to the last day of polling used to calculate support levels. The Island of Montreal contains the following ridings: Acadie, Anjou-Louis-Riel, Bourassa-Sauvé, Bourget, Crémazie, D'Arcy-McGee, Gouin, Hochelaga-Maisonneuve, Jacques-Cartier, Jeanne-Mance-Vigier, LaFontaine, Laurier-Dorion, Marguerite-Bourgeoys, Marquette, Mercier, Mont-Royal, Nelligan, Notre-Dame-de-Grâce, Outremont, Pointe-aux-Trembles, Robert-Baldwin, Rosemont, Saint-Henri-Sainte-Anne, Saint-Laurent, Sainte-Marie-Saint-Jacques, Verdun, Viau, and Westmount-Saint-Louis. Quebec City contains the following ridings: Charlesbourg, Chauveau, Chutes-de-la-Chaudière, Jean-Lesage, Jean-Talon, La Peltrie, Lévis, Louis-Hébert, Montmorency, Taschereau and Vanier-Les Rivières. The Off Island Montreal Suburbs include Laval and the parts of the Laurentides, Lanaudière, and Montérégie within the Greater Montreal Area. They contain the ridings of Beauharnois, Blainville, Borduas, Chambly, Chateauguay, Chomedey, Deux-Montagnes, Fabre, Groulx, La Pinière, Laporte, La Prairie, L'Assomption, Laval-des-Rapides, Marie-Victorin, Masson, Milles-Îles, Mirabel, Montarville, Repentigny, Saint-Jérôme, Sainte-Rose, Sanguinet, Soulanges, Taillon, Terrebonne, Vachon, Vaudreuil, Verchères and Vimont. Regions of Quebec includes the regions of Gaspésie-Îles-de-la-Madeleine, Bas-Saint-Laurent, Côte-Nord, Saguenay-Lac-Saint-Jean, Estrie, Mauricie, Centre-du-Québec, parts of Chaudière-Appalaches and the Capitale Nationale that are not within the Quebec City metropolitan area, the Outaouais, Abitibi-Témiscamingue and the parts of Lanaudière, Laurentides, and Montérégie not within the Montreal metropolitan area. The ridings contained in these regions include Bonaventure, Chicoutimi, Côte-du-Sud, Dubuc, Duplessis, Gaspé, Íles-de-la-Madeleine, Jonquière, Lac-Saint-Jean, Matane-Matapédia, René-Lévesque, Rimouski, Rivière-du-Loup-Temiscouata, Roberval, Arthabaska, Beauce-Nord, Beauce-Sud, Bellechasse, Champlain, Charlevoix-Côte-de-Beaupré, Drummond-Bois-Francs, Johnson, Laviolette, Lotbinière-Frontenac, Maskinongé, Mégantic, Nicolet-Bécancour, Orford, Portneuf, Richmond, Saint-François, Saint-Maurice, Sherbrooke, Trois-Rivières, Abitibi-Ouest, Abitibi-Est, Argenteuil, Berthier, Bertrand, Brome-Missisquoi, Chapleau, Gatineau, Granby, Hull, Huntingdon, Iberville, Joliette, Labelle, Papineau, Pontiac, Richelieu, Rousseau, Rouyn-Noranda-Témiscamingue, Saint-Hyacinthe, Saint-Jean, and Ungava. Philippe Couillard's Quebec Liberal Party is on track to win tonight's provincial election in Quebec and form a new government. Pauline Marois's Parti Québécois should form the Official Opposition, while François Legault's Coalition Avenir Québec and Françoise David's Québec Solidaire should retain their positions as the third and fourth parties, respectively, in the National Assembly. The final projection suggests that the Liberals are very likely to win a majority government, though a minority government is still a distinct possibility. All of the charts below can be magnified by clicking or tapping on them. The Liberals are projected to win between 60 and 78 seats, putting them mostly over the 63-seat mark needed to form a majority government. They should take between 38.5% and 44.2% of the popular vote. Their best performance since 2003, when Jean Charest first won a majority government, is thus possible. The precise projection is for the Liberals to take 40.1% of the vote and win 69 seats, their best result since 2008 and 2003, respectively. The Parti Québécois should finish second with between 38 and 54 seats, capturing between 26.1% and 29.6% of the vote. In terms of seats, the party should not do worse than its 2007 performance under André Boisclair, but could take its lowest share of the vote since 1970, when the PQ took 23% in its first electoral outing. The projection gives them a precise total of 26.9% of the vote and 45 seats. The former would be their worst performance since 1970. Remaining in third place should be the Coalition Avenir Québec, with between five and 13 seats and between 21% and 24.4% of the vote. More precisely, the CAQ is expected to win 22.8% of the vote and nine seats. That is a drop from their 2012 performance of 19 seats and 27.1% of the vote, but relative to the past results of the Action Démocratique du Québec, its predecessor party, it still represents their third-best result since 1994. Québec Solidaire will finish fourth with two seats and between 7.2% and 8.4% of the vote (or 7.9% more precisely), which would make this campaign their best result on record. The provincial Greens, who have fielded only 44 candidates out of a possible 125, are projected to take between 0.5% and 0.7% of the vote. Option Nationale, which has put up almost a full slate, should take between 0.4% and 0.7% of the vote. Other parties and independents are projected to take between 0.5% and 1.5% of the vote (the Conservative Party of Quebec, the party fielding the most candidates in this category, will likely finish first in this group). No seats are projected to be won by any candidate other than those running for the four major parties. Recent polling performances have taught us to approach elections with a great deal of caution, and tonight's vote should be no different. In 2012, the Liberals were under-estimated in the polls to a great degree, enough to turn a potential slim PQ majority into a very slim PQ minority. An exact repeat of 2012 is unlikely, as the Liberals are no longer a government in free fall, a role the PQ is now filling. Nevertheless, some sort of miss is still more than possible. The maximum and minimum ranges take that into account (though even here, they are designed to capture 95% of potential results). At these ranges, the Liberals could win between 48 and 83 seats and between 36.1% and 51.4% of the vote, while the PQ could win between 29 and 63 seats and between 25.8% and 34.4% of the vote. This does open up the possibility of the PQ finishing first in the seat count and second in the popular vote, but it would require a miss of the same proportions as we saw in Alberta and British Columbia. Considering how the campaign unfolded in Quebec, such a result would not only be surprising from a statistical point of view but from a completely subjective one as well. The uncertainty that prevails at the end of this campaign is more in terms of how far the PQ may fall, rather than whether a Liberal victory is in the cards. That is because of the gains the CAQ has been making in the last two weeks of the campaign. They could win between four and 23 seats and between 18.7% and 26.7% of the vote. As the party has seen its support increase in every new poll since March 19, it makes it very likely that the CAQ will end up on the high side of the projection. Indeed, the CAQ could end up with more seats than they had at dissolution. For Québec Solidaire, there is far less potential for a major surprise, ranging at between 6.5% and 9.2% of the vote and between two and three seats. That all points to improvement over 2012's result, however. The Greens and Option Nationale, even at their maximums, are not expected to be able to do much better than their projected result (and could even fall to as little as 0.3% of the vote). Fatima Houda-Pepin in the riding of La Pinière, however, is considered capable of pulling off an upset at the extreme edges of the projection. The Liberals are projected to finish first in the four regions defined by the model: the island of Montreal, the suburbs of Montreal, the Quebec City region, and the rest of the province. On the island of Montreal, the Liberals are projected to have between 50% and 57.3% support, enough to give them 20 or 21 seats. The island is a rather static place in Quebec, where few seats change hands. Even at the extremes, the Liberals are projected to still win between 19 and 21 seats. The PQ should finish second with between 19.1% and 21.6% of the vote, taking five to six seats, while QS should take between 11.7% and 13.6% of the vote and two seats. The CAQ could edge out QS for third in the popular vote, with between 11.9% and 13.9%. The region is where QS could win its third seat, and it will be interesting to see how much of the vote the party takes here. Polls have given them as much as 19% support, which would easily net them four seats, but also as little as 9%, which is less than the 12% the party captured in 2012. In the off-island suburbs of Montreal, the Liberals hold their narrowest lead with between 32.9% and 37.7% of the vote to between 29.5% and 33.5% for the PQ. This should net the PQ between 14 and 17 seats, while the Liberals take between 12 and 14 and the CAQ between zero and four. This is a bit of a swing region, as the extremes expand to 9-21 seats for the PQ, 8-16 for the Liberals, and 0-8 for the CAQ. The results for the CAQ are worth keeping an eye on, as this is the region of Quebec where they have made the most gains since the mid-point of the campaign. The Quebec City region is a two-horse race, with the Liberals between 37.2% and 42.7% of the vote, compared to between 31.5% and 36.7% for the CAQ. The Liberals should win between six and eight seats, while the CAQ should take between three and four. The PQ can win none or one. This is another swing region, but primarily for the CAQ. They could win as many as seven seats, dropping the Liberals to three. In the regions of Quebec, the Liberals should take between 35.8% and 41% of the vote and win between 22 and 35 seats. The PQ should capture between 30% and 34% of the vote and between 19 and 30 seats, while the CAQ should take between 21% and 24.5% of the vote and between two and five seats. This is the most important 'region' of Quebec in terms of deciding the electoral outcome (not surprisingly, it has the most seats in the model). This region alone could drop the Liberals to 62 seats and into a minority situation. The major electoral battles will occur in the swathe of territory between Montreal and Quebec City: the Mauricie, Centre-du-Quebec, and Estrie. More than a few three-way races could occur here. Polling in Quebec has been quite consistent, with pollsters generally agreeing on the state of the race and the trends that were developing. At the beginning of the campaign, the PQ and Liberals were neck and neck as the CAQ was well behind. But at the mid-point of the campaign the PQ began to falter, as the three other parties inched upwards. The Liberals held steady but the PQ plunged, as the CAQ increased its support significantly. 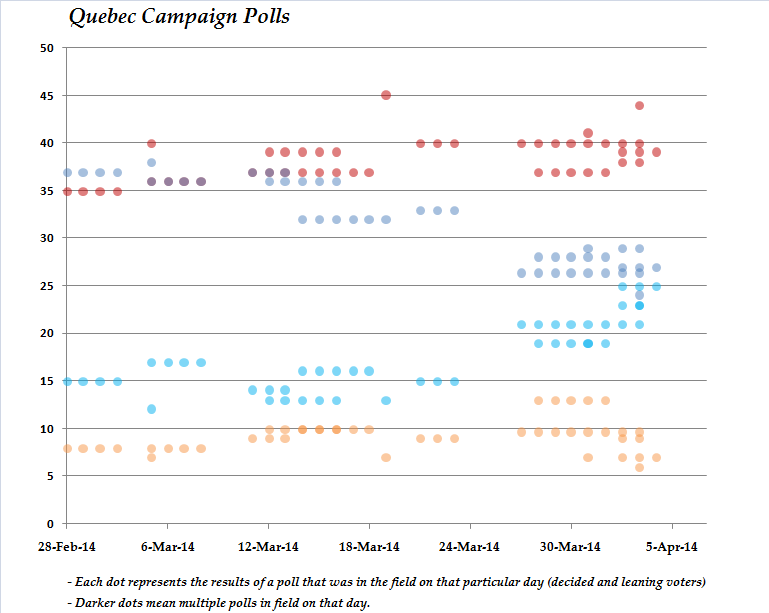 If the campaign had been a week longer, the PQ may have dropped into third. That could potentially still happen. The last set of polls have been rather consistent. 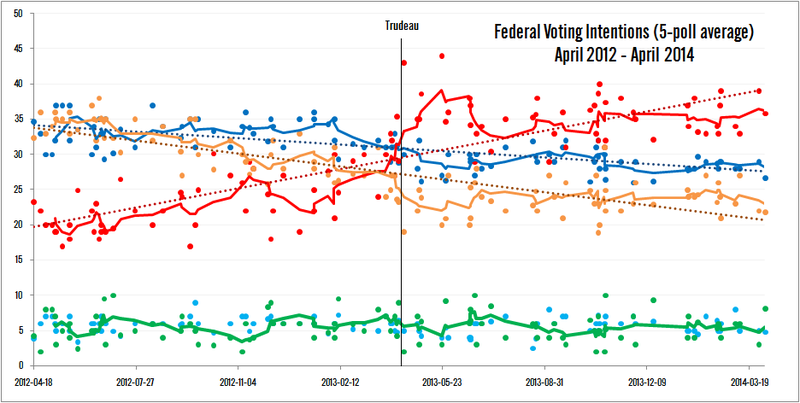 With the exception of the Forum Research poll conducted on April 3, all of the final polls (looking at likely voters, when available) have had the Liberals between 38% and 40% of the vote, a rather tight grouping. The PQ has been between 27% and 29%, which is just as tight. But the CAQ has been harder to peg. Ipsos Reid had the party at 18% among likely voters in their poll ending April 1, while the polls from EKOS, Léger, and Forum ending on April 3 had the CAQ at either 21% or 23%. 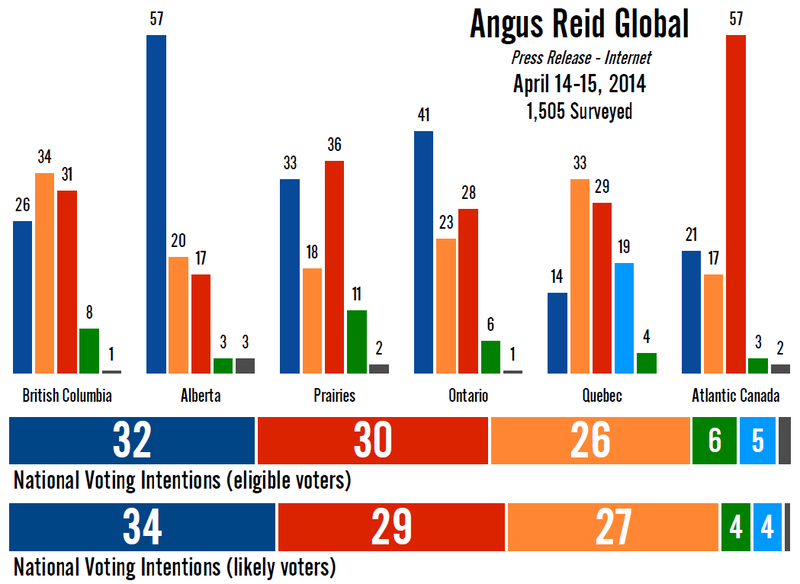 The poll by Angus Reid finishing April 4 had the party at 25%. Is that a normal spread caused by the margin of error, or are these steady gains being made by the CAQ? Did those gains plateau, or would polling conducted on April 6 have shown another two or three point gain for the party? Support for QS has been mixed as well, with the party at between 6% and 12% in the final polls. The bulk of the surveys, however, put the party under 10%, and considering its historical tendency to under-perform the polls, that is the safest bet. But the polls have been generally even throughout the campaign, with little real controversy or outliers. It has been interesting, however, to see the polling being dominated by firms from outside Quebec. Léger was the only Quebec-based firm to be polling up to the end, while the other surveys in the last week came from Ipsos Reid, EKOS, Forum (all Ontario-based) and Angus Reid (B.C.-based). CROP dropped out of the field, publicly at least, after their poll of March 13-16. CROP had been very active in 2012, so that was unusual. There was also a great lack of riding-level polling, with only two surveys being released during the entire campaign, after one in five ridings were individually polled in 2012. Both Philippe Couillard and François Legault have seen their numbers improve throughout the campaign. The most frequently polled question, on who would make the best premier, showed gains for both leaders. Couillard had started the year at between 22% and 25% on this question, but as the campaign progressed that increased to between 26% and 27% to 30% in the last Angus Reid and 33% in the final Ipsos Reid. Legault went from 13% to 15% before the campaign began to between 23% and 25% at the end of it, putting him either in a tie or ahead of Pauline Marois. The incumbent premier dropped from 30% to between 20% and 25%. Forum was the only firm to also ask approval rating questions, and here we see growth for Legault again. His approval rating was 32% at the beginning of the campaign, while his disapproval rating was 49%. In Forum's last poll, Legault had an approval rating of 57% to 27% disapproval. He really had a stellar campaign - but most of it in the last two weeks. Couillard's numbers were stable after an early jump from 34% to 44% approval. His approval rating barely deviated from that to the end of the campaign, while his disapproval rating topped out at 42% in the final week. 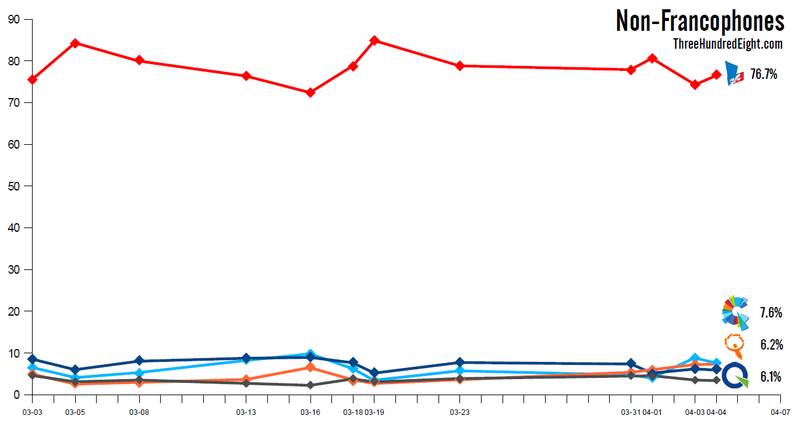 Marois's approval ratings dropped insignificantly but consistently, from 34% to 32% and then 31% at the end of the campaign, as her disapproval rating increased from 58% to 65%. These three sets of numbers tell the story of the election rather well. An early bump for Couillard that held steady (a good way to describe his campaign), and sustained decrease and increase for Marois and Legault, respectively. Pauline Marois is given a 55% chance of winning her riding of Charlevoix-Côte-de-Beaupré, with between 36% and 41% of the vote against 33% to 38% for her Liberal challenger. One would expect a leadership bonus to make her safe, but we've seen many cases of leaders losing their seats in recent elections (Darrell Dexter in Nova Scotia, Christy Clark in British Columbia, Michael Ignatieff and Gilles Duceppe in the federal election of 2011). It is a similar situation in Roberval, Philippe Couillard's chosen riding. He lives there, but he certainly did not choose an easy seat for himself. The Saguenay-Lac-Saint-Jean region is not known for its Liberal leanings. The model considers the riding a genuine toss-up, with the PQ given a 50% chance of winning it with 38% to 44% of the vote against 37% to 43% for Couillard. Oddly enough, François Legault is slated to be the leader most likely to win his seat of the three main parties. And this after he spent most of the campaign expected to lose. He is given a 61% chance of winning L'Assomption, with between 38% and 44% of the vote against 35% to 39% for the PQ candidate. Françoise David is the safest leader going into tonight's vote, with an 87% chance of winning her Montreal riding of Gouin. She is projected to take between 47% and 54% of the vote, against 27% to 30% for the PQ candidate. Her co-spokesperson, Andrès Fontecilla, is unlikely to be successful in the neighbouring riding of Laurier-Dorion. Gerry Skalvounos of the Liberals is given a 73% chance of winning, with between 38% and 43% of the vote against 25% to 28% for Fontecilla. I would bet on a better performance for Fontecilla, however. Most commentators, including yours truly, expected the Parti Québécois to be successful in its quest for a majority government. The PQ was dominating among francophones and Couillard was starting to look like he had the leadership instincts of an Ignatieff. The CAQ was being squeezed out of the debate on the charter. But in the end, a mismanaged, chaotic, and inconsistent campaign sunk Pauline Marois and the PQ. As soon as the focus turned to a potential referendum, the Liberals made headway as the best anti-PQ option. And as soon as the PQ started to flail wildly as its poll numbers dropped, Legault began to look like the better anti-Liberal option. It was a disaster for the PQ from start to finish. This is what makes the last polls of the campaign believable. One could argue in Alberta that Wildrose did not have the feeling of a government about to come to power, or that in B.C. the New Democrats had not really waged a winning campaign. It would be shocking if the PQ somehow managed to win this election tonight, after itself giving every indication that the party was on track for defeat. The behaviour of the party over the last few weeks has not been the behaviour of a party doing well. The Liberals have only been out of power for 18 months. Are Quebecers ready to give them a majority government? Will voters who want nothing of a PQ victory but still feel uncomfortable with the Liberals go over to the CAQ, now that a PQ re-election is no longer likely? Will the PQ manage to convince enough sovereigntists not to split the vote in order to prevent a majority victory by the Liberals? The CAQ's voters have been recorded in poll after poll as being much less committed to their party than supporters of the PQ and Liberals. Will those voters waver when it comes time to cast a ballot? Does the CAQ have enough organization to get out its vote? Will the momentum that has been carrying Legault and the CAQ forward in the last few weeks continue and push the party to new heights? And will QS be able to better its historical under-performance of the polls, concentrating its vote in the right places? Or will their high hopes be squashed again? We'll find out tonight. It has been a whirlwind of a campaign, so plenty could still have occurred in the final days after the pollsters left the field. But Philippe Couillard and his Liberal Party appear set to prevail.